My intention for this piece was firstly, to break out of my usual way of working and to try some new techniques. I had to keep reminding myself of this as I felt myself drifting back to trying to make a perfect thing. Being a lover of music, I wanted to convey the feeling of being uplifted into a different world outside of myself. I wanted the piece to be painterly and of an ephemeral quality. 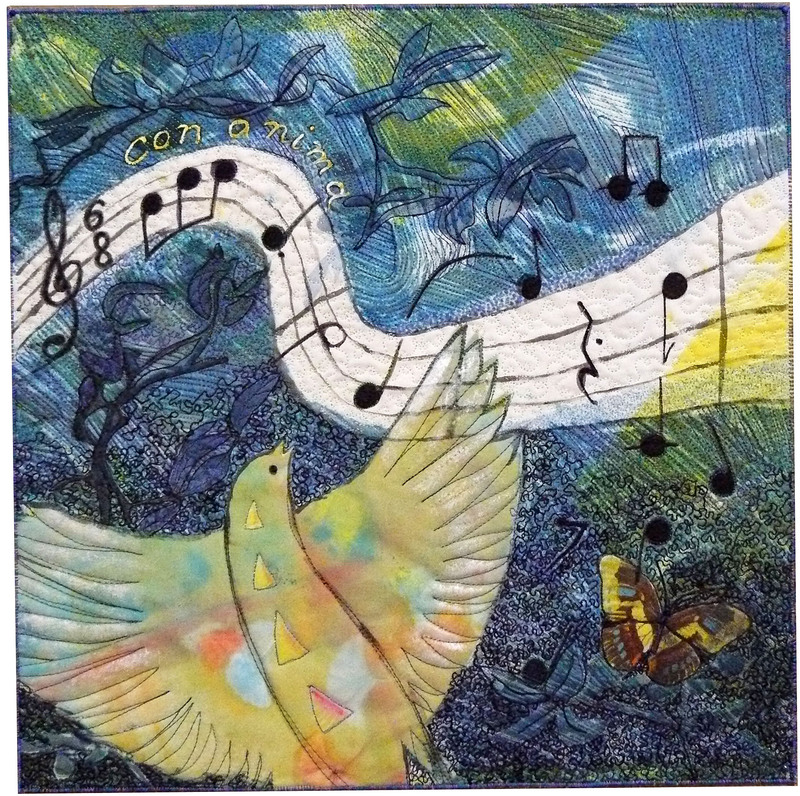 I used elements, such as the bird flying upwards, indicating the spirit, and a strain of music, which is escaping from its boundaries, to represent this concept. I cannot imagine spending even one single day without listening to music! The quilt is a whole cloth created in two layers; one cotton, and one silk organza (I have been keen to work with transparency for a while). I was guided by the techniques mapped out in Melanie Testa’s ‘Inspired to quilt’. 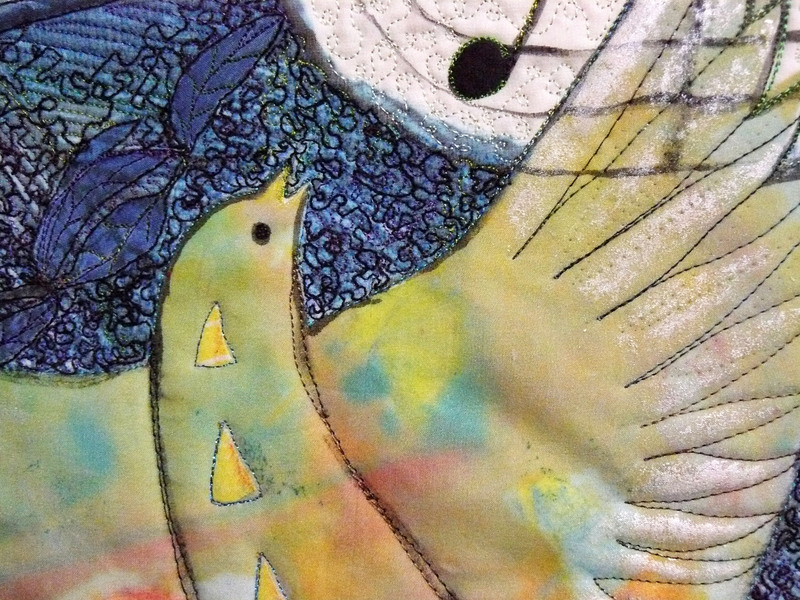 Each layer is mono printed with thickened dyes with various resists. The top layer bird and music is hand painted. I made eight at the one time and experimented on each. This was far too many, as I soon got worn out free-motioning all the backgrounds. Next time I could make smaller samples. One problem was how to make the notes stand out, whilst keeping them in balance with the other elements. I ended up cheating a bit and darkening them with a black fabric marker. I had the same issue with the words. The butterfly was not in the original design and kept vying for attention- I had to knock him back a bit with a stencil brush and grey Shiva stick! 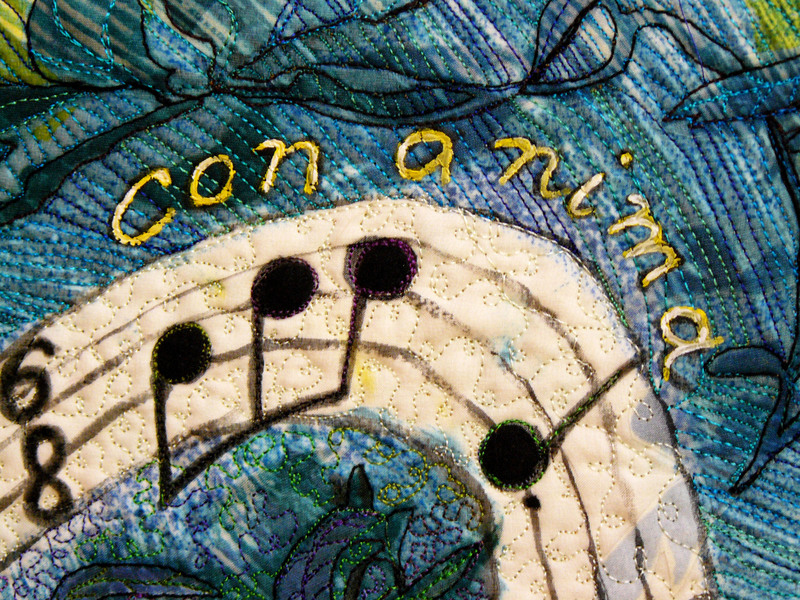 I really like the way the quilting follows the brush strokes in the organza; I’ll definitely do that again. It took a while to work out the best way to quilt the stave. I didn’t feel monofilament stippling would be very interesting and finally settled with shimmering rayon in a horizontal curling pattern. I would have liked to add some hand embroidery, but I thought the background was busy enough with the leaves. I will definitely incorporate more of these new techniques and materials into my work. I’m hooked on mono printing!